How many emails did you get through using them? How do you know the status? How many people opened your follow-up message? If you have no clue for the answers above you most likely are not functioning a follow-up campaign effectively. These are crucial element that must be explored when you are choosing an autoresponder. Some good steps to take to ensure you are getting what you need out of an autoresponder include.. Compare your autoresponder with those of top marketers; chances are they are using the best in the business. You can’t go wrong with this approach. Other observations you might make are related to spam filters. Have you ever gotten an e-mail and seen something like this…”F`R`E`E” Yes this is a good way to beat the spam filters as they won’t read Free they will read something totally different. However it can be time consuming going through your article and finding which words are “Hazard” words. This can go a long way in your Marketing endeavours. So make sure you find an autoresponder that has a spam rating feature…these features will automatically show you where in your article your “Hazard” words are. Another crucial element of e-mail marketing is your statistics. How many e-mails are being opened can tell you if your subject line is any good or if you did a good job branding your name. If you know your e-mail statistics you are one step in the right direction in optimizing your potential sales. 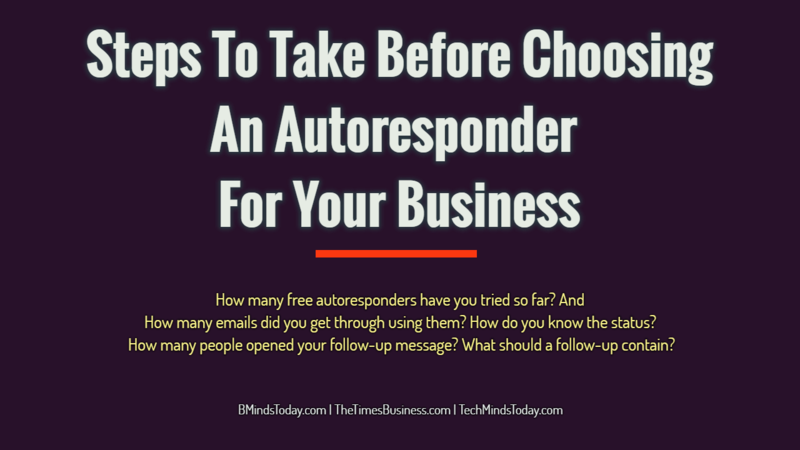 Finding an autoresponder that shows in depth analysis with your follow-ups are also key. Many experts suggest directing your subscribers to a full article located on the web. There are some worthy motives for this. You can create an excitement teaser in the follow-up e-mail and beg your article to be read on the web. There is also the chance that since you have an article archive on the web many subscribers will often read more than just your original article. Your subscriber might not be interested in one article but they may find what they are looking for browsing through your previous articles. Broadcasting! So your subscribers are finished receiving their original followup series… now what? Find an auto responder that allows you to broadcast an update or an offer to the entire subscriber list. Don’t let your subscribers go to waste, this feature is a must! Remember not to fool your hard earned subscribers. Present them with a problem and offer them a solution!